Lifetime sheds feature double-wall, steel-reinforced construction and steel roof trusses, making the sheds structurally sound so they won't buckle during storms, or dent during everyday use. Weather-sealed seams help keep out water, and wood-grain molding, a simulated shingled roof and natural color scheme create an aesthetically pleasing addition to the yard or garden. Made of polyethylene, a plastic that won't degrade, leading to costly maintenance. UV-protection, along with stain and mildew-resistance, make the Lifetime sheds easy to maintain, while a sturdy floor and generous headroom promote versatility. Most sheds include integrated shelving, windows, skylights and screened vents. Lifetime sheds come with a high impact polyethylene floor made from rigorous materials designed to be shock resistant and easily maintained. The floor is resistant to oil, solvents and stains and features a slip-resistant surface. The polyethylene exterior is maintenance free, stain resistant, never needs painting, UV protected to prevent fading and cracking, and weather resistant keeping the interior dry year round. Shed accessories such as hanging kits, shelves, shelving units, corner shelves, wall hooks and window kits can be added for all your organizational needs. The first video below details many of the Lifetime shed's features. 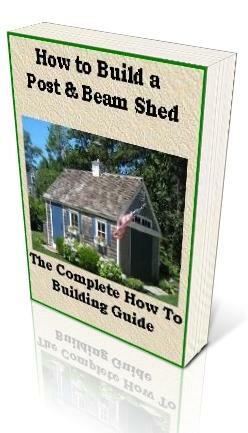 The second video below shows how to build your Lifetime shed kit. Lifetime Shed Video: Details features and efficient storage options for your Lifetime shed. 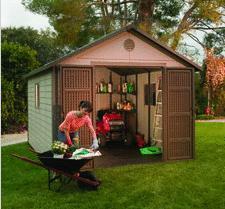 News from the Homefront with Don Zeman: If you are looking for more storage space, Don shows you a great shed option. Lifetime Shed Video: Assembling a Lifetime Shed kit. Couple builds a Lifetime Shed while their kids are at day care. Very well done, it points out a couple assembly steps to pay close attention to and offers tips for novice do it yourselfers.